You can use an SSH client like PuTTY to connect to your Lightsail instance. PuTTY requires a copy of your private SSH key. You might already have a key, or you might want to use the key pair that Lightsail creates. Either way, we've got you covered. For more information about SSH, see SSH and connecting to your Lightsail instance. This topic walks you through the steps to download a key pair and set up PuTTY to connect to your instance. You can also connect to your instance from within the Lightsail console without installing or configuring any software. For more information about connecting to your instance using the Lightsail console, see Connecting to your Linux or Unix instance in Amazon Lightsail. You need a running instance in Lightsail. For more information, see Create an instance in Amazon Lightsail. We recommended that you create a static IP address and attach it to your instance so you won't have to reconfigure PuTTY if your public IP address changes later. For more information, see Create a static IP and attach it to an instance in Amazon Lightsail. PuTTY is a free implementation of SSH for Windows. You can learn all about PuTTY on this page, including restrictions related to countries where encryption isn't allowed. If you already have PuTTY, you can skip to Step 2. Download the PuTTY installer or executable file from the following link: Download PuTTY. If you need help deciding which download to choose, see the PuTTY documentation. We recommend using the latest version. Go on to Step 2 to get your private key before you configure PuTTY. Choose Account on the top navigation bar, and then choose Account from the drop-down. Choose the SSH Keys tab. 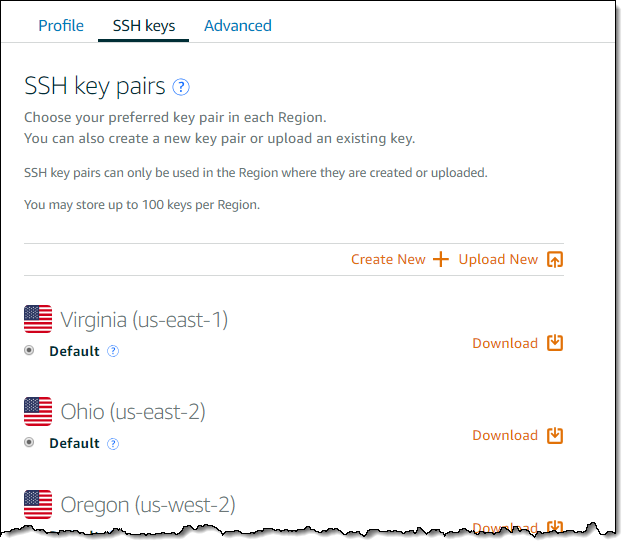 To use the default private key that Lightsail generates, choose Download next to the default private key for the region where your instance is located. To create a new private key in Lightsail, choose Create New. Choose the region where your instance is located, and choose Create. Enter a name, and choose Generate key pair. You will be given the option to download the new key. To use your own private key, choose Upload New. Choose the region where your instance is located, and choose Upload. Choose Upload file, and then locate the file in your local drive. Choose Upload key when you're ready to upload your private key to Lightsail. If you downloaded the private key, or you created a new private key in Lightsail, then make sure to save the .pem key file somewhere you can easily find it. We also recommend that you set permissions for the file so that no one else can read it. Now that you have a copy of your .pem key file, you can set up PuTTY using the PuTTY Key Generator (PuTTYgen). Start PuTTYgen (for example, from the Start menu, choose All Programs, PuTTY, PuTTYgen). By default, PuTTYgen displays only files with the .ppk extension. To locate your .pem file, select the option to display files of all types. Choose lightsailDefaultKey.pem, and then press Open. PuTTYgen confirms that you successfully imported the key, and then you can choose OK. Choose Save private key, and then confirm you don't want to save it with a passphrase. If you choose to create a passphrase as an extra measure of security, remember you will need to enter it every time you connect to your instance using PuTTY. Specify a name and a location to save your private key, and then choose Save. You're almost there! Hang on while we make one last change. From Lightsail, grab the public IP address (hopefully you're using a static IP address) from the instance management page. You can get the public IP address from the Lightsail home page, or choose your instance to view more details about it. Type (or paste) the public IP address into the Host Name (or IP address) field. Port 22 is already open for SSH on your Lightsail instance, so accept the default port. Under Category, expand SSH, and then choose Auth. Choose Browse to navigate to the .ppk file that you created in the previous step, and then choose Open. Choose Open again, and then choose Yes to trust this connection in the future. For more information about instance operating systems, see Choosing an image in Lightsail. Be sure to save your connection for future use. If you need to connect again, see Connect to your Lightsail instance using PuTTY.